Nestling on a bay on the shores of the Mediterranean Sea, Mersa Matruh (often called Marsa Matruh in some holiday brochures or occasionally spelled Marsa Matrouh) is less than 149 miles west of Alexandria and can easily be reached by air through Matrouh International Airport or Burg El Arab Airport in Alexandria. Whether you spell it Mersa Matruh, Marsa Matruh or Marsa Matrouh this small harbour town and the newly developed Almaza Bay Resort Complex are great places for a holiday in Egypt! Founded by Alexander the Great, it was used as a port by the Egyptians of Ptolemaic times, the Byzantines and the Romans. It is justly renowned for its four and a half miles of exquisite soft white sandy beaches and the calm, gentle, azure waters of its bay which is enclosed and protected by a natural rock harbour. Almaza Bay is just a short drive from Mersa Matruh and the International airport, and is the perfect location for all inclusive Egypt holidays. 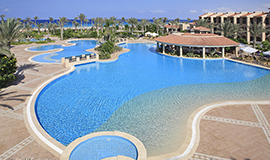 It is a relatively unspoilt and tastefully developed Egypt holiday resort that offers virtually constant sunshine and calm waters. Mersa Matruh is well connected to other towns and cities like Alexandria and Cairo by road and rail. 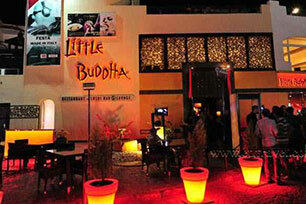 The town enjoys a lively, relaxed, night life and atmosphere boosted by the fact that it’s becoming popular as a get-away for residents of Cairo escaping the capital city’s sweltering summer months. During World War II, the railway station named Marsa Matruh was the terminus for the British 8th Army’s single-track railway which shipped men and material to El Alamein, where Rommel’s offensive against the allied forces in the western desert ultimately ground to a halt. Rommel's Cave, which the Desert Fox used as his staff headquarters, is also close to the town and has been converted into a museum. 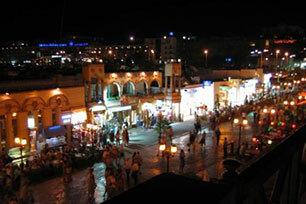 Mersa Matruh is second only to Alexandria in terms of importance and size in the north of Egypt. It’s located at the western end of the 310 miles of the “White Coast”, named for the clean and beautiful marble white sands that stretch along the fringes of the Mediterranean Sea. The beaches in Mersa Matruh are truly stunning, unspoilt and relatively uncrowded. Cleopatra and Anthony fell in love on these beaches and it’s said that Alexander the Great stood on the sand and asked the waves about his destiny. The beaches of Mersa Matruh and Almaza Bay are all enchanting, pristine and idyllic. Ageebah Beach west of Mersa Matruh and features numerous natural caves and enchanting scenery. Al-Abyad Beach has a beauty that surpasses even the beaches of Mersa Matruh itself beach and the Gharam (romance) beach is especially captivating. Unlike resorts on the Red Sea, Mersa Matruh is not a year-round sunshine destination however temperatures still average around 22° C from April to October and peak at 34° C in July and August. Thanks to its position on the coast there is always the benefit of cooling sea breezes. Despite the development at Almaza Bay, Mersa Matruh is nowhere near as built up as some Red Sea resorts and still retains an air of tranquillity. Diving in Mersa Matruh is not as developed as other locations such as Sharm El Sheikh or Hurghada, as the diving on the Mediterranean coast is much more seasonal than the year-round resorts on the Red Sea. However, there are a wide range of commercial diving schools and summer clubs with PADI qualified training staff have sprung up around the Almaza Bay area and in Mersa Matrouh itself. There are several impressive wrecks lying off shore. The leisure facilities at Mersa Matruh and Almaza bay will ultimately include one of Egypt’ largest championship golf courses. Egypt is already popular with tourists due to its beautiful landscape and exceptional sightseeing attractions and having hosted events like the European Challenge Tour and the European Seniors Tour featuring golf courses like La Residence des Cascades, Egypt is now being taken very seriously as a golf destination. Despite it being a relatively recent addition to Egypt’s holiday destinations, Mersa Matruh has a rich history, ancient and more modern. Ramses II built a summer palace here more than 3,000 years ago which was the epitome of luxury compared to the cave used as Rommel’s Afrika Korps headquarters during the Second World War. During the Ptolemaic period Mersa Matruh was known as Paraitonion and in Roman times the area was called Paraetonium and there are a number of monuments and remains that that date back to the Roman and Greek periods. 290 km along the coast towards Cairo (about three hours by road) is Alexandria, known as "The Pearl of the Mediterranean". This great city was founded by Alexander the Great in 331 BC and became the capital of Graeco-Roman Egypt. It was also home of one of the Seven Wonders of the World with the Pharos lighthouse standing astride the harbour mouth until it’s destruction in an earthquake. It’s here too that the stormy relationship between Cleopatra and Mark Antony developed and where Napoleon landed at the start of his campaign in Egypt. Within few kilometres of the centre of Mersa Matruh lie the remains of Cleopatra's Palace, next to her famous baths and the Ptolemaic Egyptian Fleet Anchorage with the remains of its naval installations. Facing the city is Rommel’s Cave, originally cut by the Romans to store grain. The former HQ for General Erwin Rommel’s push against the British in North Africa, the cave is now a museum that contains some of the brilliant Afrika Korps commander’s belongings including his compass, photographs, maps and clothing. sea and the high hill fort of the Italian Cemetery. There are several international brand name and retail outlets adjacent to the Almaza Bay hotel complexes with a host of specialty restaurants and night spots, a movie theatre and a world class conference centre. 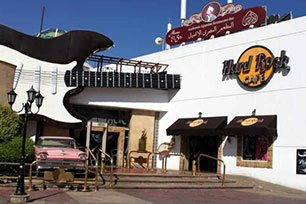 More adventurous tourists can sample the shopping possibilities in Mersa Matruh itself. The town has long been regarded as a trade centre for the nomads of the Western Desert where they can sell their handmade artefacts and livestock. You’ll find a large number of bazaars displaying souvenirs and items from Egypt and Libya alike at good prices and high quality. Jewellery, especially gold items, is astonishingly good value for money sometimes selling for what seems like just a little over the price of the metal itself. Clothes and shoes can also be incredible value while leather items are generally very good value with standards of workmanship just as high as the quality of the leather. 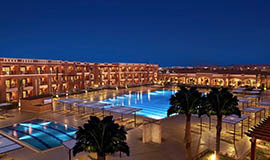 Jaz Almaza Beach Resort nestles on the Mediterranean Sea, just 38 km east of Mersa Matruh on the northern coast of Egypt. 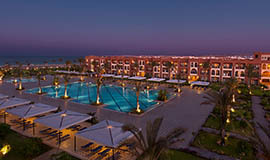 Jaz Crystal Resort is Jaz Hotels, Resorts & Cruises second major development in Almaza Bay, opened only as recently as May 2009. 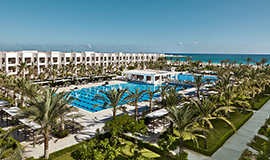 Jaz Oriental Resort is another major new development in Almaza Bay on Egypt’s north Mediterranean coast, alongside the recently launched Jaz Crystal Resort and the Jaz Almaza Beach Resort. 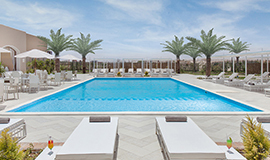 Jaz Oriental Club is located on a beautifully landscaped 23,000m2 piece of land in Mersa Matruh, to become one of the most beautiful Egyptian resorts. 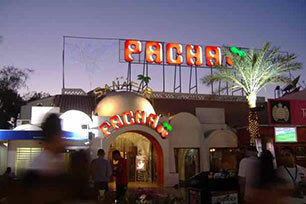 Until about the late 1960’s Sharm El-Sheikh was just a quiet fishing community but increasing investment has made the “City of Peace” one of the best known and most visited Egypt holiday destinations. Sharm El Sheikh offers sun, sea and sand with luxury five-star hotels, water sports and some of the finest Red Sea diving as well as shopping and entertainment. It’s a vibrant and lively resort with just about all the amenities you’d expect of a well developed tourist centre including casinos, discos and nightclubs, golf courses and health clubs, camel riding, desert safaris and nearby antiquities to visit.